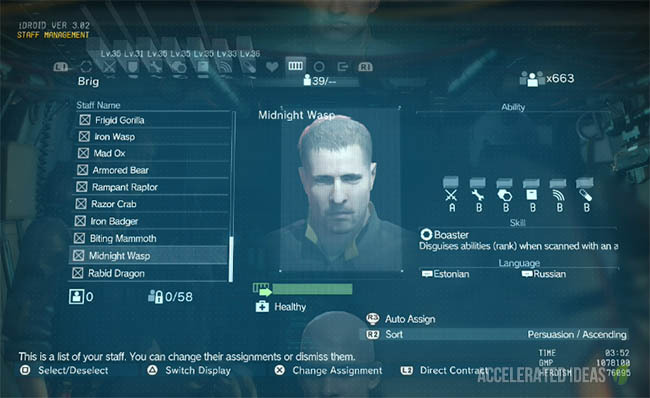 Mother Base comes with a set of units (platforms) including R&D, Intel, Support, Medical and several others. In this guide I'll show you how to increase Unit levels quickly so you can unlock new options and weapons. 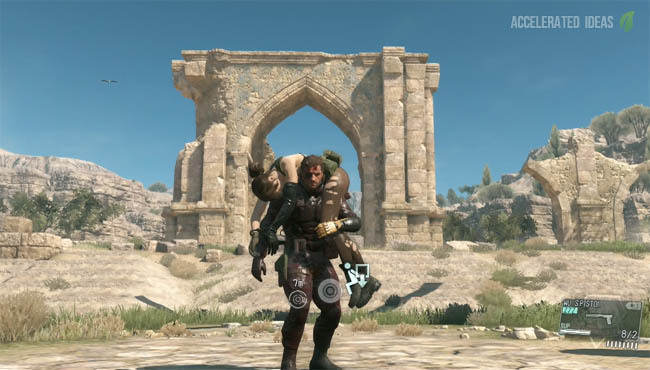 Early in the game I found that the R&D platform was the most interesting because I wanted to try out some of the new weapons and in particular I wanted to start Fultoning gun placements and mortars back to Mother Base to sell for GMP. Each of these upgrades was locked behind a certain R&D level in addition to a light sprinkling of GMP. Money wasn't really a problem for me at the start of TPP, but Unit levels were holding me back. I had managed to fulton a fair number of soldiers from the early missions but most soldiers came with a low D or E rank in most areas. Here's the trick though, you can open iDroid and select Staff Management. Then skim through each of the staff lists and make a mental note of any staff who possess "decent" skills for the area you want to progress. For example I wanted to level up R&D so I skimmed through Support, Intel...looking for anyone with a fair rating in R&D who may have been automatically assigned into another area. Just because they have say a C in Intel, they might also have a D in R&D, which would outrank anyone with an E in R&D. I proceeded to move out the E ranks from R&D and swapped in the C or D ranks from other areas. This reduced my Intel and Support levels but I was able to increase R&D to a higher level and unlock some of those elusive weapons. The moral here is - don't trust the game to automatically assign staff members for you. Instead prioritise which area you're most interested in then manually shift staff around to boost that areas overall rating. You can always move staff back again later so there's nothing really to lose by experimenting. As a good example, check the image above for Raving Rhino. This soldier has a B rating in Base, Support and Intel meaning that he could be beneficial to all three Units. However, the game can only slot him into one of the three and that might not be the Unit you want to progress first. This is a prime example of a staff recruit that could be shifted around to suit your preference. 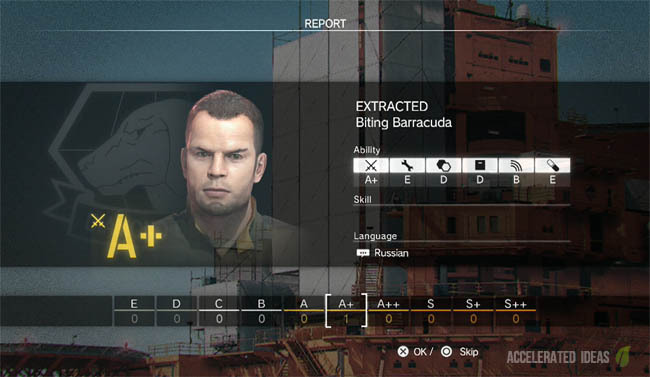 If you're serious about ranking up Mother Base quickly then you need to go into missions with non-lethal tactics and the Fulton device close at hand. Pay close attention to the soldiers you're stalking. Officers and commanders will have much better stats vs foot soldiers. These officers can be distinguished by their uniforms, in most cases wearing red caps and remaining away from the front lines. You won't find many high ranking soldiers in outposts so concentrate on the Side Ops or main missions where high profile targets are mentioned. For example, early in the game there's a mission to kill three Russian commanders in Afghanistan. Rather than going into this mission with guns blazing, sneak through the base and knock out these soldiers instead. Then Fulton them back to base for some extra high ranking staff. These commanders usually come with A or B ranks in certain areas making them highly useful for levelling up Units at Mother Base very quickly. Every Unit on Mother Base (Support, Intel, R&D etc.) has a limit on the number of staff you can assign to it. If you don't expand Mother Base platforms then you won't increase this maximum level and any captured soldiers will be assigned to other Units; in some cases not their ideal unti. 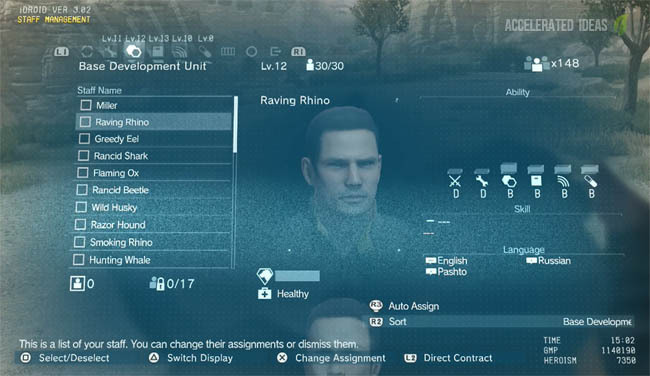 Therefore, when you start to reach the maximum number of staff for a particular Unit consider expanding the platform using the Mother Base - Facilities menu option from the iDroid. It will cost a fair amount of GMP and valuable resources (e.g. Fuel) to expand your base so always pick up collectibles when you're out on missions.